Gone fishing. Beautiful memories of two lives entwining one another. You will be forever in my heart and walk beside me each day. 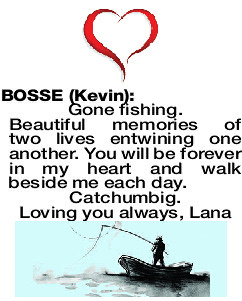 A Service to Celebrate the Life of Mr Kevin Bosse of Mandurah will be held at the MARRADONG Cemetery, 6786 Pinjarra Williams Road, Boddington on TUESDAY (09.04.2019) commencing at 11.00am. 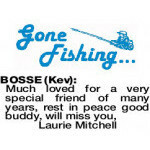 Those wishing to pay their respects to Kevin are invited to attend the Viewing at Purslowe Chipper Funerals, 108 Pinjarra Road, Mandurah on MONDAY (08.04.2019) at 3.00pm. 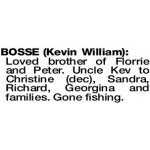 Loved brother of Florrie and Peter. 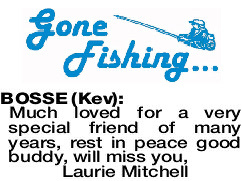 Uncle Kev to Christine (dec), Sandra, Richard, Georgina and families. Gone fishing. 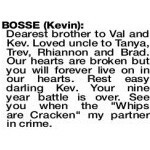 Dearest brother to Val and Kev. 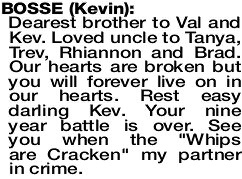 Loved uncle to Tanya, Trev, Rhiannon and Brad. Our hearts are broken but you will forever live on in our hearts. Rest easy darling Kev. Your nine year battle is over. See you when the "Whips are Cracken" my partner in crime.